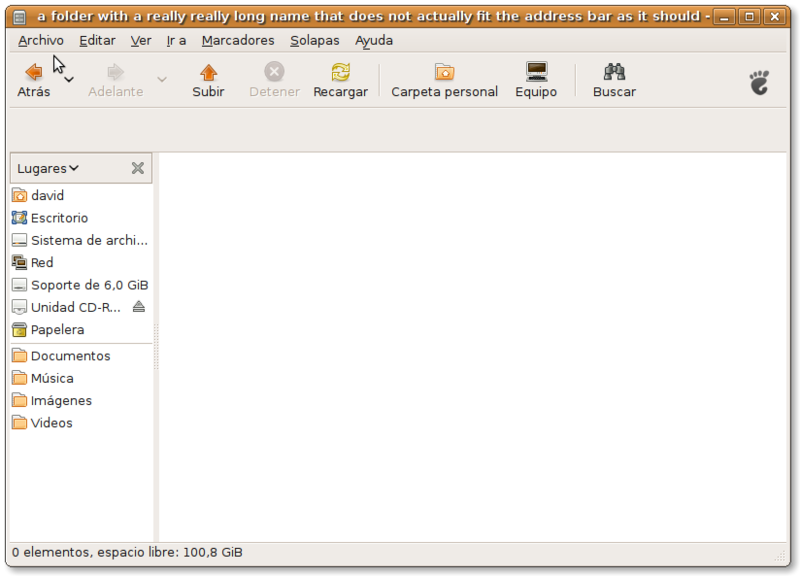 If you create a folder with a really long name it will somehow mess with the pathbar buttons, so nothing will be shown. Try to create a folder and call it "a folder with a really really long name that does not actually fit the address bar as it should". Open it and see what happens: the pathbar buttons, as well as the view and zoom buttons, disappear from the nautilus window. Even if the name is not so long and it actually fits the address bar, it may be the case that there is only place for it in the bar. 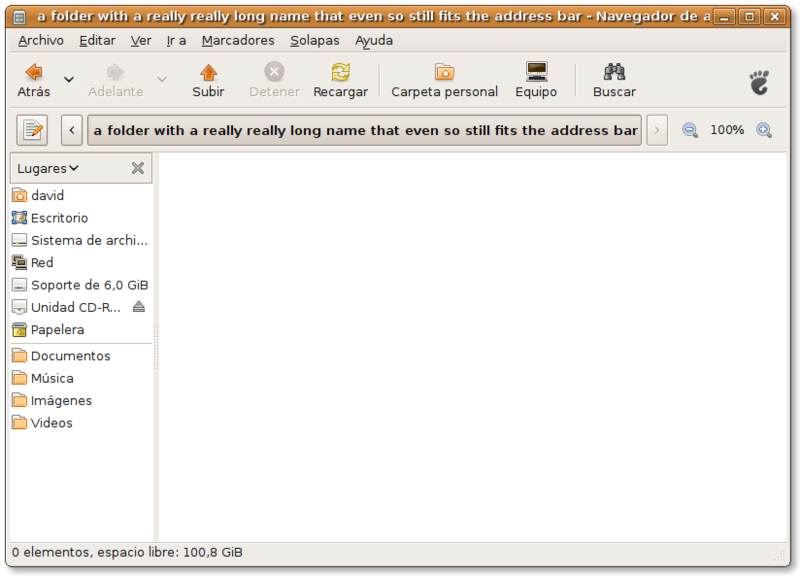 Try creating a folder and call it "a folder with a really really long name that even so still fits the address bar". Then open it and see what happens. Parent folders are not shown. This defeats the whole purpose of the bar as a navigational element, and is therefore not efficient. What I'm proposing is, ellipsize folder names that exceed a certain size in the path bar. Show the whole name on the window title, maybe on a tooltip if you keep the cursor hovering over the button, but keep pathbar buttons under a certain size. 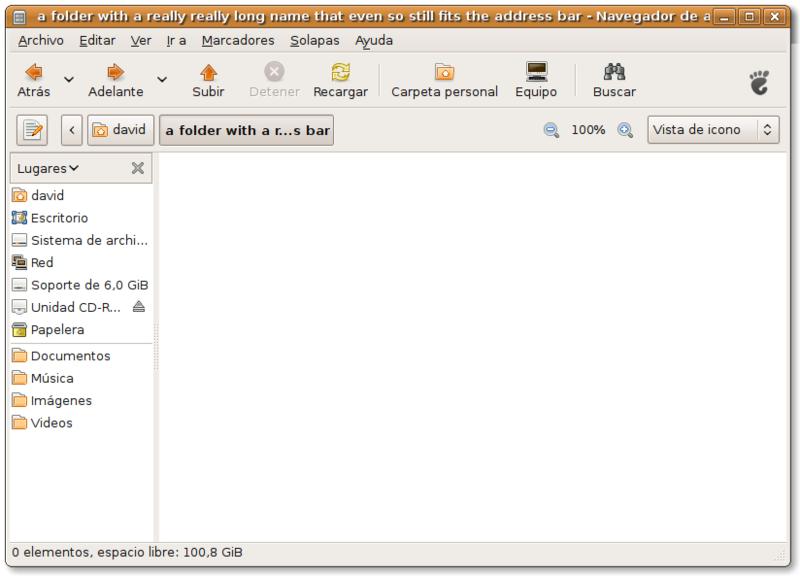 There's a bug upstream describing issues with the location bar also and saying also that ellipsize should be used there, the bug is here: http://bugzilla.gnome.org/show_bug.cgi?id=550215 ; linking the report, thanks for reporting. The patch could be improved to eliminate the hardcoded width (200px), to allow the label to be as wide as possible without the pathbar vanishing entirely, but I'm not quite sure how to approach that yet. Wow, this is a bad bug. Good catch! I think it should truncate the long folder name to the first few characters followed by "..."
To make it more usable, when putting the cursor over that part of the location bar, we could display the complete folder name in a tooltip. The patch is a bit of a hack, and should be improved upon. There has been no recent comments from upstream about it. My last discussion (December?) with some upstream devs wasn't conclusive. If anyone wants to take a poke and try something else, other ideas are welcome! I was just experiencing the same bug here. to me this bug is critical and should be fixed asap.